This stereocard is labeled on the back in script "Section of 'Big Tree' which stood at 'Geneseo' where Indians held their meetings, Portage Park" The piece of this famous tree is visible under the unique shelter Mr. Letchworth built to protect it from the rains and weather. This portion of a large oak had once stood on the flats near present day Geneseo, not far from the site of the negotiations between the Seneca and Americans that resulted in the Treaty of Big Tree. As years passed, the Valley's inhabitants looked upon the oak as a reminder of the early Indian and pioneer history of the Valley. The Genesee River claimed the Big Tree in 1857, but James S. Wadsworth preserved it by sawing the trunk into sections and drawing it from the water. The piece shown above, reported to be the uppermost of the saved sections, was presented to Mr. Letchworth for his Council Grounds in June of 1878. 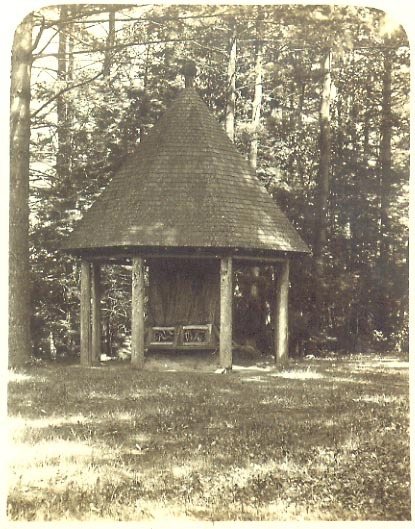 Mr. Letchworth placed it on the opposite end of the Council Ground from the Mary Jemison Statue, sheltered it by the conical roof, and surrounded it by rustic benches. This section, as well as its shelter, seemed to vanish during early renovations of the Council Grounds completed in the decade after Mr. Letchworth's death in 1910.